The ever-elusive descriptor of “mature” can be an alluring qualifier for the modern anime fan, especially in today’s state of the industry where, well, somewhat immature shows are a dime a dozen. Not knocking the immature shows, I had as much fun with Kill la Kill as the next guy and am a big fan of Gintama, but sometimes the heart yearns for something more. Well, hope ya like liquor, because today that something more is Bartender, a series about a bar with drinks served by… Hououin Kyouma! (You can’t deny, the resemblance is uncanny.) Whether or not it lives up to any expectations is a discussion worth having, so without further delay, let us begin. As always, the review is provided in video format above and transcribed directly below. Do you have a problem? Not sure what you’re doing? Hung up on an old flame? Fallen out with a good friend? Just need to get drunk? Come to Eden Hall, serviced by the young master bartender Ryuu Sasakura, popularized by his nickname “The Glass of the Gods”. No mountain is insurmountable to this expert of a man, whose duty it is to ensure that all customers have nothing less than a pleasant evening at Eden Hall. I want to mix things up a little, so before we jump into the show itself, let’s take a look at the credits. Every episode of Bartender focuses on a specific drink, which is made abundantly clear by a provided recipe at the end of each episode, but the real highlight is that, over the credits, a live-action Ryuu actually makes the glass in question. I like this simply because it is different and therefore memorable. They could’ve gone for the standard slow pan over still shots of the bar or the characters, but that would’ve been pretty dull, especially since the accompanying song is largely forgettable, so I’m glad they went with a more unique approach. I can’t say Bartender’s opening was nearly as creative, and its animation was in fact rather minimal, but the tune was nice, even if the lyrics were a little strange, like “konya wa donna yubizukai de yowasetekureru tsumori kashira?” which translates to “I wonder how you will use those fingers to get me drunk tonight”. After that brief aside, it’s time to look at the meat of the series. While not to the same extent as, say, Mushishi, Bartender is more or less episodic (which I have no inherent problem with). The general plot of each episode is that Eden Hall has a new visitor with some kind of emotional or mental anguish, and Ryuu uses his bartender’s arsenal of cocktails and conversation to help them get over their problems. That means that one of Bartender’s strengths, again, like other episodic series such as Mushishi, is in its nature as an anthology. It affords you a look into the lives of several different people, which can be intrinsically interesting. One episode could focus on a stressed hotel owner with a disdain for bartenders, who mellows through his time at Eden Hall, while another may tell the story of the tumultuous relationship between a certain screenwriter and director, who reconcile thanks to the Glass of the Gods. Naturally, as well as casting a wide net of characters, Bartender also shows off a number of drinks. Like I mentioned earlier, each episode features one cocktail that functions as the centerpiece of that week’s plotline, usually by serving as Ryuu’s chosen remedy for his customers’ ails. This angle of the show didn’t do much for me because I’m not one for alcohol, but if you’re some kind of bar connoisseur, you might enjoy it. I need to call out Episode 8 as an episode that did a lot of things right (in a series that, ultimately, did plenty of things wrong, as you will find shortly). The basic premise is that, when a couple visits Eden Hall, Ryuu realizes that the man (claiming to be a doctor) is a con artist, and confronts him about it afterwards. On the whole, the plot from that point is fairly straightforward, which works in Bartender’s favor by removing the possibility of fumbling with overwrought dialogue or complex backstories. It’s an episode that allows Ryuu’s skill as a bartender to realistically come to the fore without feeling forced or questionable, and the conclusion introduces a nice wrinkle as the story closes. Given such a short series (only eleven episodes), the relative strength of each narrative is very important to the show’s overall quality, because only a few bad apples can cast a shadow over everything else, but the reverse is also true, and episodes like the eighth are proof that Bartender is, at least, not entirely without merit. At this point, you can rightly assume that Bartender fancies itself a more mature anime (there’s that word again). You won’t find moe schoolgirls anywhere near this one, which is refreshing in today’s oversaturated climate. Bartender tries to foster deeper conversation, talking about things like how to find happiness or feel sympathy for your fellow man, but the key word there (unfortunately) is “tries”. In other words, I appreciate the attempt, I appreciate trying to be a show that markedly differs from the norm, but if you don’t nail the execution, the audience is only left with a feeling of disappointment at what could’ve been so much better. My, that’s a convenient transition. My chief issue with Bartender is that it was putting on airs. The entire thing reeks of feigned depth, pretending that everything has to have some deep, symbolic meaning, every cocktail a vivid, poignant backstory that teaches a life lesson we should all remember. It feels embarrassingly self-indulgent, and unduly proud of its laughable philosophical musings. Customer: Sir, your bar door, it’s so heavy. Ryuu: Well, that is because this is not a door for merely anyone to open. It is heavy enough that only those with the proper strength of soul may enter, temporarily breaking the barrier from the outside world into this isolated hideout, this sanctuary of liquor. Ryuu: Heh, just kidding. Placed an order for the wrong door when I built this place. Putting aside the joke at the end, the rest of that skit is a legitimate paraphrasing of an early scene. Bartender’s dialogue often comes across as far too hammy, to the point of unintentional comedy. Did you know? Bartenders don’t actually serve liquor. No, their true purpose is to serve “joyous recollections”. That’s an actual line, mind you, and is quite tame compared to some of the other conversations. The show treats Ryuu as some sort of wispy, philosophical wiseman, which (if you recall from my Mushishi review) is exactly what I don’t want out of my anime, or anything really, because it only makes me roll my eyes, especially in this scenario. Bartenders aren’t some sort of pseudo-philosophers that can somehow diffuse any tense situation with the proper words and drinks, and the show’s attempt to play this off as such prevents me from taking anything it’s doing seriously. Not every drink has to have some big, contemplative story behind it, or every little argument the makings of life-changing advice. Bartender, you’re not being deep or thoughtful, you’re just finding some kind of smug satisfaction in thinking that you are. The therefore relatively uninteresting proceedings of Bartender’s plot and characters is made no better by the animation. The series is a 2006 anime produced by Palm Studio. Coincidentally, Palm Studio went defunct in 2007 one year later, and not to be mean… but it shows. Look, I can forgive the bottles and the cocktails being CGI because, y’know, fine, maybe it let them produce a more visually authentic array of alcohol. But does the entire bar need to be 3D? Do the scenes need to be so motionless, so boring and static, or the characters so poorly drawn? It’s almost remarkable how often the Glass of the Gods is drawn off-model, hardly ever as clean and proportionally correct as his sole opening appearance. Some older TV anime, like, say, Stand Alone Complex, visually age very well. Bartender is one of those that does not, to at times a cringeworthy degree. 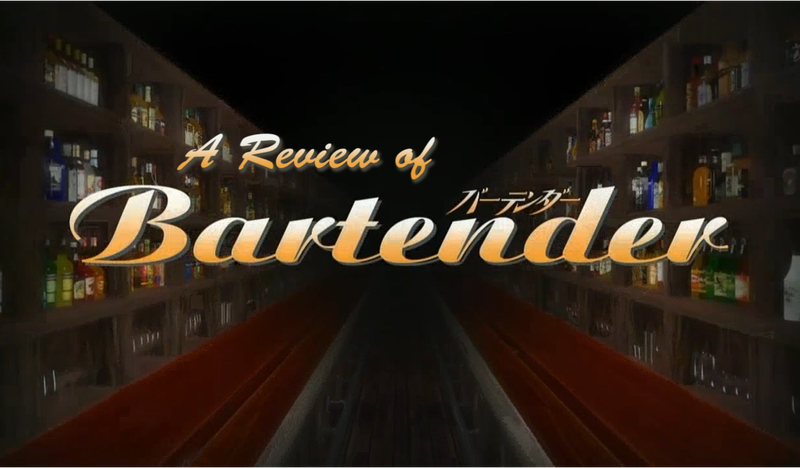 As a result of the combination of poor animation and utterly dissatisfying attempts at philosophy, Bartender becomes nothing less than a very boring show, and there’s no better entertainment-killer than that. It’s never firing on all cylinders to give you a great experience worthy of your time. The basic structure itself isn’t fundamentally at fault, but being episodic can only work if each episode, or at least the vast majority, are engaging. Bartender is far too hit or miss. The stories that it tells don’t stick with you, or do for all the wrong reasons. Bartender doesn’t have tons of problems, but those few that exist are massive enough to leave it dead in the water. It, to me, feels like a series that a hipster art school student would laud as a masterpiece for its “insightful examination of the human psyche” and “profound discussion on the indubitably constitutive properties of the individual soul”, etc, etc. For anyone else, it’s a slog with very little in the ways of excitement or even basic entertainment. Poorly produced, poorly plotted and poorly philosophical, Bartender is a series that could’ve been much better if it wasn’t so obsessed with making its grandiose points, because it was at its best when it ditched the philosophy and focused on the characters, but the two are so tightly intertwined that this was an unfortunately rare occurrence. So, after taking everything into account (as well as my own subjective enjoyment), on a scale from F to S, I serve Bartender a D rating. There were just enough glimmers of good ideas or strong-ish individual stories that I can’t justify a full F, but that doesn’t change the fact that I doubt I’d recommend Bartender to anyone at all (unless you are one of those hipster art school students). Despite my rating, if you liked what you saw here and want to see more, check the series out at - you know what, no, no! I’m not gonna do it. Firstly, because Bartender is not available anywhere for legal streaming, but secondly because, if you like what you saw here, just go watch Mushishi! I hate to keep bringing up the Mushishi comparison, but it just does what Bartender tries to do way better. It’s better animated, more compelling, and longer to boot. Hell, if you just want a bar, go watch Death Parade, another series that handles life lessons far better without beating you over the head with its philosophy.